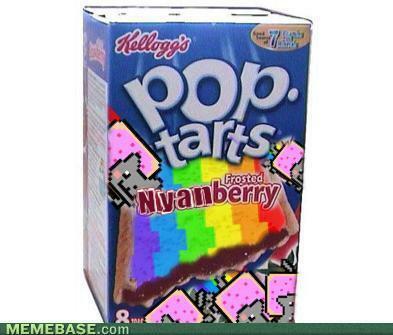 Nyanberry Poptarts, Anyone?. I wish it were real! XD. Wallpaper and background images in the Nyan Cat club tagged: cat nyan lol nyanberry poptarts anyone poptart kellogg's. This Nyan Cat photo might contain makopo nyama, kibati nyama, kopo nyama, wa video ya, kanda ya video, nougat bar, and mwambaa nougat. Wait a minute... didn't i post this a while ago?! WTF MAN?! I wonder what it would taste like!